Wow that got deep quick! Kinda makes you stop and think for a bit. It's a nice element (no pun intended) that Tahu isn't one to just follow the virtues blindly like everyone seemed to do in the story, he has serious concerns about the ethics and the ups and downs of those. Tried doing a few things differently with this page. It was cathartic after those last coupla' pages drained me. Edited by NickonAquaMagna, Sep 21 2017 - 04:23 PM. I like where this is going even more now. It's still the classic overall storyline, but you've got such a fresh, new take on it... and I love the way you've seriously thought through things that a lot of fans - myself included - just took for granted without really considering, like the meaning behind the virtues. Also, just for the record, if this was a real physical graphic novel? I would buy it right away. I love how much the sky adds to these scenes. So glad I took those pictures when I did. Even if the quality isn't great, gumming them up to look appropriately cartoony for this isn't too hard. Enough with the exposition dumping, time to see some Rahi fighting in the present! Is what I'm sure some are thinking after these five pages of non-stop talking... don't worry, we're not far off from that. Sorry to say this is it for now. I need a break, so I'm taking the week off. Hopefully the comic will resume this next saturday. What's everyone's impression of this so far? As far as the "first issue" and the first few pages of the next one go? It's really good so far! The worldbuilding is excellent and the storytelling is remarkably fitting. 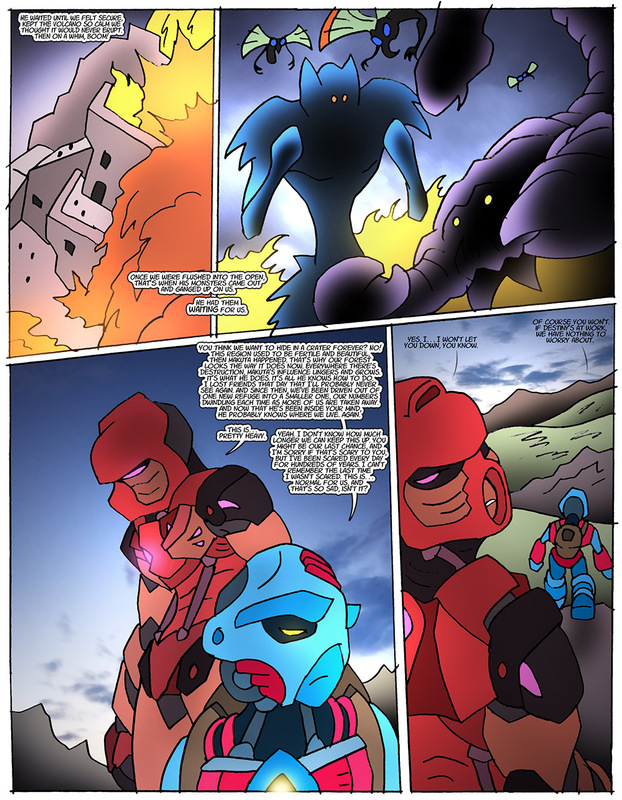 Wow, I cant believe Vakama just told Jaller to shut up. Edited by MechaAshura20, Sep 24 2017 - 03:50 PM. He used their lord's name in vain. Love it so far! Eager to see how the next developments go! Can't wait to see the other Toa. Your art style's terrific. Also enjoying the introspective digression. Adds another layer to it, assuming you circle back round these themes. Which give that they're the Three Virtues, I don't see not happening. Three cheers for well-done fantasy theologies! Very nice, I still prefer the Toa washing up vs. crashing, buy your story seams much more fast paced than the original. I also prefer the concept of all male ta matoran, all female ga matoran ect, but that does restrict storytelling a bit. Anyways its a great start to the retelling. PS. That bit where Jala says "Mata Nui" and Vakama rebukes him was a stroke of genius. My comment was on the first page by the way. Yeah.... ever since I saw that shot from the cancelled PC game of the cans falling from the sky, that image stuck with me and I was SO DISAPPOINTED when Dume and the other Turaga revealed that no, they'd been floating in the ocean for all that time. Given the later revelation that Mata Nui's robot body crash-landed on the planet, that he himself literally fell from space, I was even more dumbfounded by this retcon. It seems perfectly plausible to me that the Toa cans could've been EJECTED from the robot as he was falling and remained floating up there until the Turaga realized their heroes were taking too long to show up and appointed Takua to summon them. ....and I think I just gave away another thing I've changed about this story (their pods being ejected while Mata Nui was still in space, I mean). Oh well. There's something weird about Ga-Matoran and Toa of water being uniformly female. It pushes the stereotype of women being wiser and fairer than men and puts an undue burden on any given team's Toa of water to be the voice of reason when the male members fight or whatever. Makes you wonder how many Toa teams may've been dysfunctional to the point of disbanding if they didn't have the "girl ninja" tempering them. Changing that just seemed like a good idea. Actually yeah after the robot crashed it ejected the toa canisters. 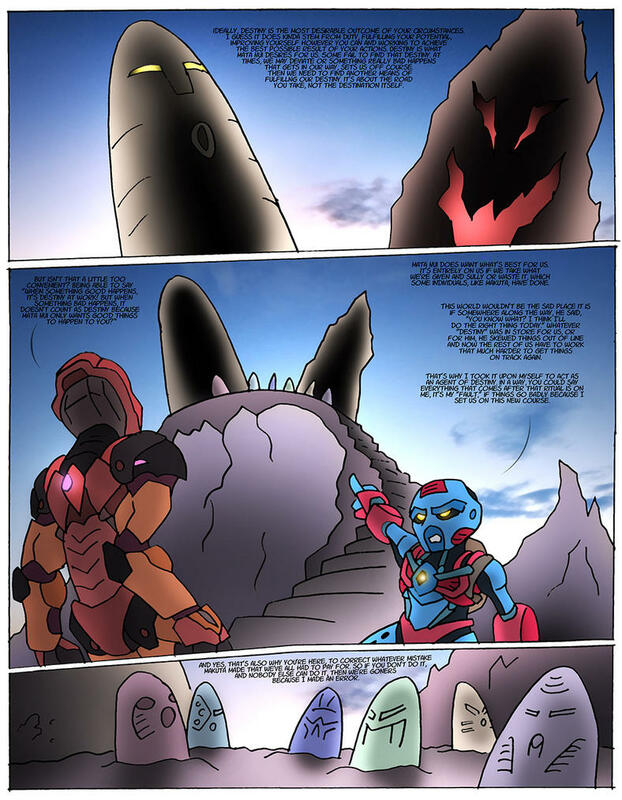 When Takua placed the stones to summon the Toa 1000 years later is when the canisters propelled themselves toward the island. Oh yeah. I'm just saying I thought it'd be neat if they were ejected on the way down before Mata Nui landed, as if to make it harder for Makuta to intercept the canisters somehow. Yeah, your changes make a better story, I'm just getting nostalgic about the original, keep up the great work. I would love more of Le-Wahi. Just that one frame of Lewa being covered in paint and flowers was so laughably amazing that I want more. Oh, uh, and the other stuff going on is good too, I guess. 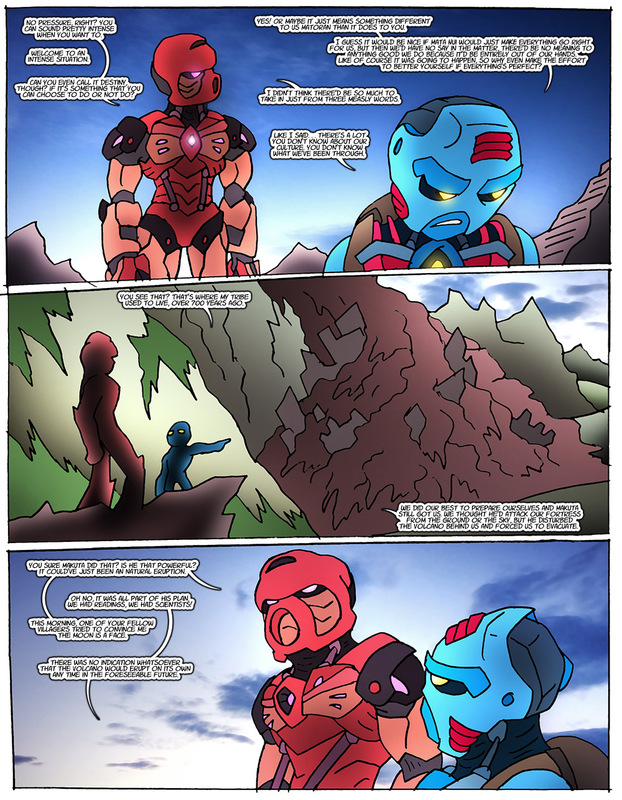 I'm intrigued that Takua doesn't mention his friends dying, just that he'll probably never see them again, that they're 'taken away'... I have a theory. There was a cut part of MNOG where there was supposed to be a seventh village of shadowy Matoran who worshiped Makuta - did the Matoran Takua's talking about turn into that hidden shadow village? I'm so... happy to see all this come to life. MNOG is by far my favorite piece of Bionicle, and seeing revived like this with the little twists you give it... it's fantastic. Everything just fits. And thank you for keeping the sci-fi part of the world intact, that there are scientists and machines alongside stuff like the sun being an angry face in the sky. I don't know, it seems like there's this trend whenever people try to re-imagine Bionicle, that everyone's just these ordinary tribal islanders and all the weird tech you see in MNOG just falls by the wayside. And it just doesn't (pardon the pun) click the way Bionicle itself did. I'm so glad you've kept that steampunk-sci-fi stuff in. It feels right, it feels like home. And... sheesk, the attention to detail here is crazy! Vakama, with his welding mask, his Metru armor pieces, those crazy eyebrows... Nixie with her telescope, the candle-head Onu-Matoran, Makuta constantly whispering to Tahu to sleep and slumber, everything. Everywhere I look there's so much Bionicle layered down, woven together, and like I said before - it all fits. Not like everything is supposed to be an overt reference to 'the good old days', but how all the different details have been drawn closer together, tighter, more coherent than they were to begin with. And I can't get over how awesome that is. I know you're trying to build up tension in the plot, but I can't help but take a relaxing breath when I see all this. It really does feel like home to me. On one final note, I'm sure some people have realized that I've been using one of your Nui-Jaga artworks as an avatar for the past few years. I got so hyped seeing those Rahi silhouettes in Takua's flashback! I can't wait to see how my favorite Rahi has evolved with your drawing style. So - keep up the fantastic work! Thanks. Sorry to say, this month is gonna be kinda crazy. I've begun work on the Planet Ripple trailer, but it's a collaborative effort so I'm still working things out with other people. I can only hope I'll have finished editing it in a week or so. Once that's out of the way and I've prepared everything I need for the convention, I'll get back to this. Wish me luck. And yeah, I know it feels a lot like MNOG right now.... but this story's gonna go some crazy places before it's over. 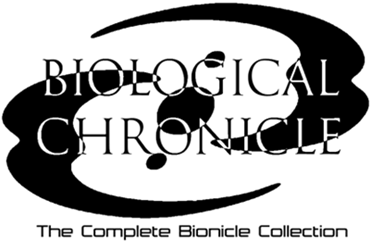 I'm going to keep it as coherent as I can, but if there was only one year for finish Bionicle's story, well it's going to end up being very different and have a different message at the end. No 7th tribe, sorry to say. I only just found out about that unused concept yesterday. But the Matoran are being taken... somewhere. You'll find out later. Edited by NickonAquaMagna, Oct 02 2017 - 12:13 PM. It's all good. Quality work takes time, especially something like this which is so unlike anything I've seen on BZP over the past fourteen-odd years. Can't wait for more. I've been meaning to read this since it was featured on the front page, but only just now got around to it. I'm so glad I did, though! This is a fantastic mix of classic elements of Bionicle's story with new, interesting, and bold ideas (and it certainly doesn't hurt that the art is amazing, too). I'm hooked! Feel free to take your time on updating, though. A new page every day is a lofty goal, and I know I would be more than happy with an update every week or so. Edited by TuragaNuva, Oct 11 2017 - 07:31 PM. I'll get back to it soon. Right now, I basically just need one line for the Planet Ripple trailer, and then it's done. After that I've gotta finish a few commissions and I'll get back to updating this pretty regularly. One page a day... no way, then it would take years and years to finish this comic. I'm going to wrap it up within one year if I can help it. "This morning one of your fellow villagers tried to convince me the moon is a face." ...'Nuff said. This story is amazing. Link to my comics coming soon... once I start them, that is.